I love Rick Bayless‘ style. Anyone who’s eaten at one of his restaurants or watched his show, Mexico: One Plate at a Time, can tell he knows his stuff when it comes to Mexican flavors and ingredients. So whenever I’m in the mood for Mexican, I look to him for ideas; that’s where this yummy twist on standard guac came from. The mango really brightens the dish, and the serrano chile adds a layer of flavor that goes so well with avocado. Definitely a go-to for guacamole lovers. Buen provecho! Cut avocado in half and remove the pit. Scoop the avocado flesh into a mixing bowl. Add salt and pepper and mash with a fork or potato masher. Add mango, red onion, cilantro, lime juice, and serrano chile. Stir to combine. 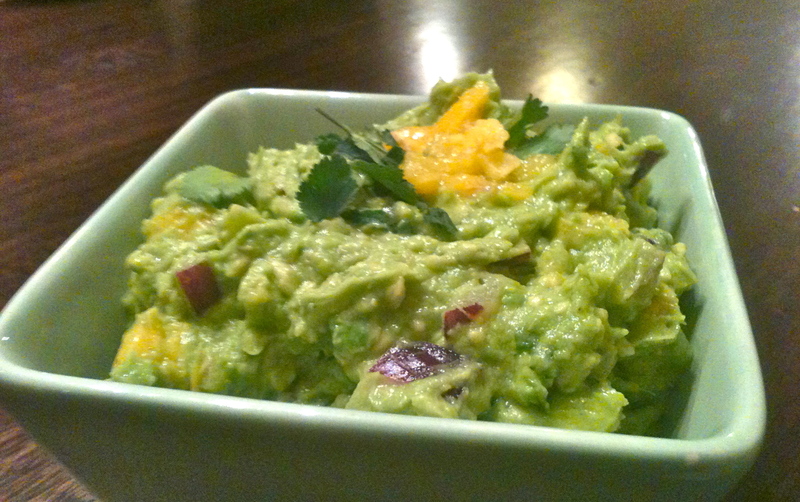 Garnish with more mango and cilantro and serve with tortilla chips.